When I talk about grilling as much of dinner as possible, I’m not kidding. The main course is a given. So are most of the vegetables and sides. How about something different? How about mashed potatoes? However, by placing them on a plank and grilling them, I’m still accomplishing my grilling mission. Better yet, the result is better than anything coming right off the stove as the smoldering plank envelops the potato in a layer of sweet smoke. 1. While I include a mashed potato recipe, the truth is, they are mashed potatoes, and everyone makes them a little different. Make them how you like them, just as long as they aren’t from a box. 2. Soak a cedar plank in water for at least one hour. 3. Fill a medium sized pot with about an inch of water. Insert a portable steaming basket, cover the pot and bring to a boil. Add the potatoes and steam until fork tender, about 12-15 minutes. 4. Empty the pot and wipe dry. Add the butter and potatoes. Mash while adding in the milk. Add the milk slowly to reach the right consistency. Stir in the sour cream, garlic, and rosemary. Note: The potatoes can be made a day in advance and kept in the refrigerator until time to grill. 5. 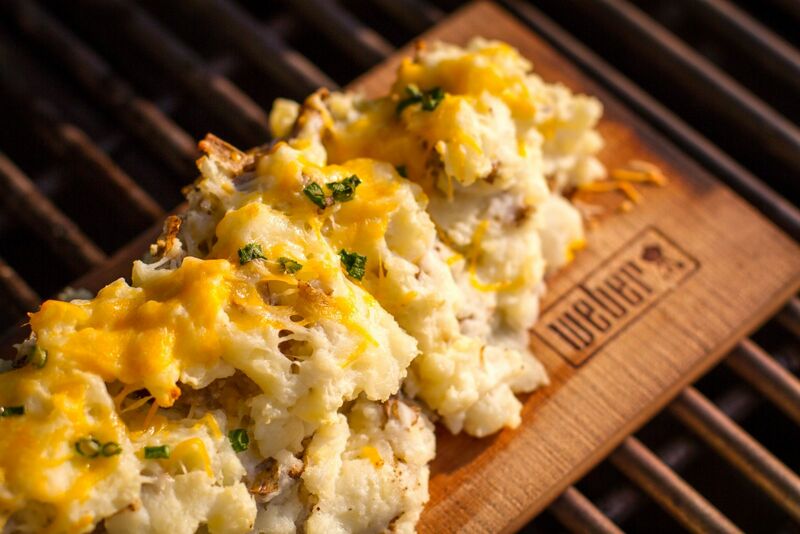 Prepare the grill for indirect medium heat, 350 F. Mound the potatoes on the cedar plank and top with cheese and green onion. 6. Grill over indirect heat for approximately 20 minutes, or longer if the potatoes have been refrigerated. There are a million variations for making these potatoes, which is part of the fun. Not only is it an easy side dish that tastes great, but it’s an awesome bit of presentation moving from grill to table.